We are competing for the Aviva Community Fund and we are through to the public voting stage. In order to secure a place in the final, we need to gather as many votes as possible during the voting period. What are we hoping to fund? Music Treehouse (MT) is for SEN/D children who have a wide spectrum of needs. It includes children who are isolated and struggle with issues around communication and interaction, who have profound Autism, difficulties with Mental and Emotional Health and sensory and physical disabilities. MT is a hugely important project for a community of young people and their families who struggle to find out of school activities that are accessible, engaging and life-enhancing. It provides a fun, secure, environment where children can learn and practice vital life skills, and are provided with a safe environment in which to develop their confidence and well-being. Seeing a child’s face and the pride that they feel when they have the ability to make music is simply exhilarating and the health benefits of the sensory and kinaesthetic nature of music cannot be underestimated. Assisted by a specialist team, they learn to play and interact through creative music composition creating personal, and intricate pieces of music. However, they really need specialist equipment which fulfils different needs as having the right instruments is hugely important. MT is still in its infancy but is already oversubscribed meaning we desperately need to purchase a collection of specialist instruments to supplement the ones we currently borrow. We currently have no electronic instruments, so can’t properly serve students with severe mobility disabilities and only a very limited range of standard percussion. 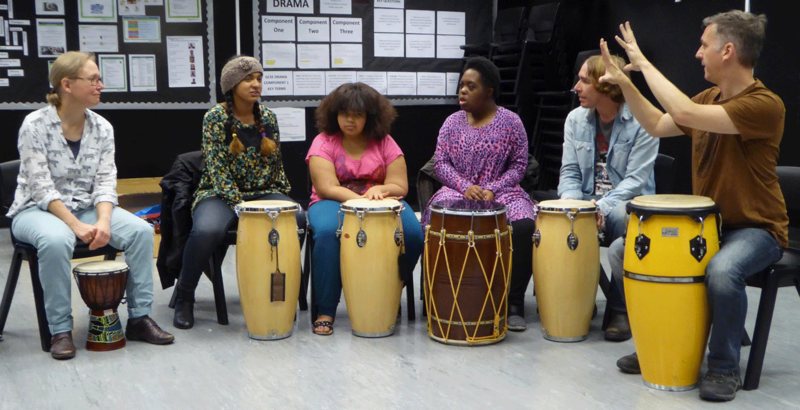 A £5,000 grant would allow us to purchase a pool of instruments enabling us to create a fully inclusive ensemble and the impact would be immediate for our students. • Nuvo clarinets, flutes and pBones: lightweight plastic instruments which can stand a lot of use, and are wonderful for students with more movement and less profound disabilities. My pupils are thrilled to take part. Their enthusiasm is outstanding and they love to tell their friends at school about MT. This has helped build their confidence and discover hidden talents they never thought they had! The families of children with SEN/D often feel very isolated – the SP has a thriving and supportive community spirit with parents and students from across all programmes forming new friendship groups. The Programme is a place for families to meet other families in similar situations over coffee and cakes in our tuckshop. Likewise, the students not only have the opportunity to socialise with their group but also with the other students at the Programme. This social aspect is hugely beneficial to MT families’ well-being, with our staff always finding time for those who need a helping hand. A really happy environment to learn and have fun. My child so looks forward to attending – thank you for everything! 2. You will be sent an activation link via email when you register (check spam). 3. Click that link & complete your profile. 4. Return to our page and use the VOTE button – you have TEN (10) votes so please make sure you use all TEN (10) for us! 5. Share this post or our Aviva page with your friends & family, encourage them to register and vote.